Udaipur’s romantic allure is down to the magnificent Lake Palace that appears to float on Lake Pichola; from a distance, Sajjan Garh (Monsoon Palace) emerges like a miniature painter’s masterpiece on a ridge; and the old city, an amalgamation of quaint bazaars, winding streets and the city wall. 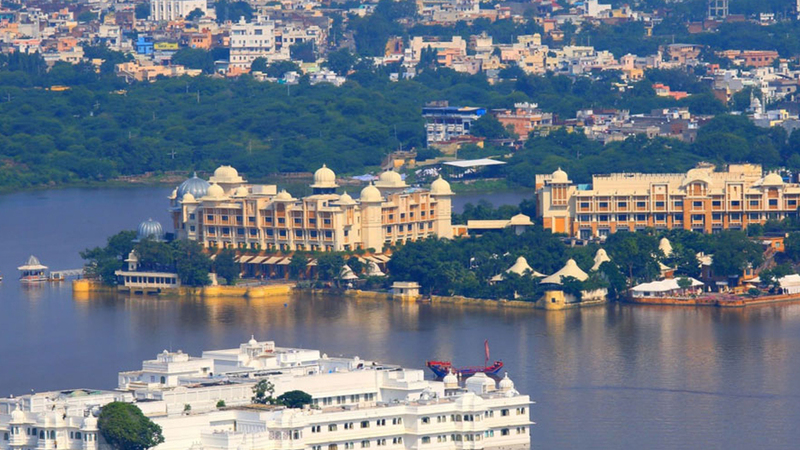 All of this come together to make Udaipur a topping travel destination in southern Rajasthan. If you’re travelling here in February-March, Udaipur’s streets are bursting with colour. The festival of Holi celebrates the onset of spring, a period of dreamy weather before the harsh summers, and locals make the most of this holiday. The royal family hosts an ornate function at the City Palace, while the rest of Udaipur is an animated Jackson Pollock painting. The festivities continue into April with the Mewar festival, the perfect time to catch cultural performances and a heady procession that culminates at Lake Pichola. 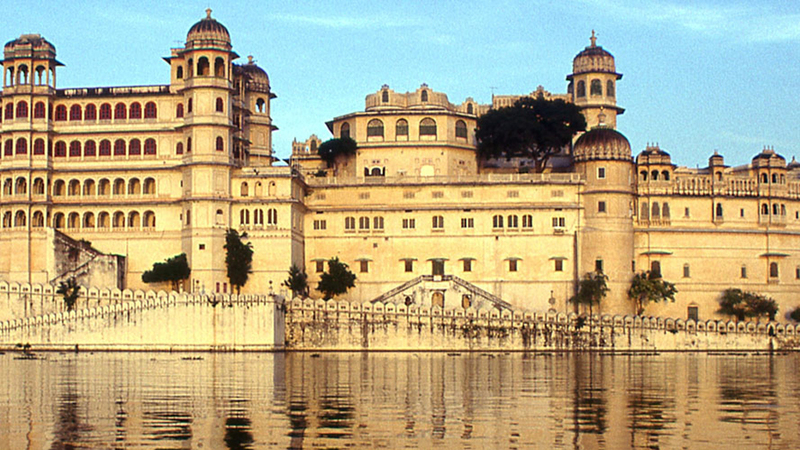 Founded in 1568 by Maharaja Udai Singh II, Udaipur was a fiercely independent princely state. Its Mewar rulers defended their kingdom valiantly from the Mughals and the Marathas, finally signing a treaty in the 19th century with the British that pledged protection from other invaders. Udaipur is said to be the most romantic city in India. Don’t take our word for it and check out these places to visit in Udaipur that make the City of Lakes and Palaces the shimmering jewel of southern Rajasthan. 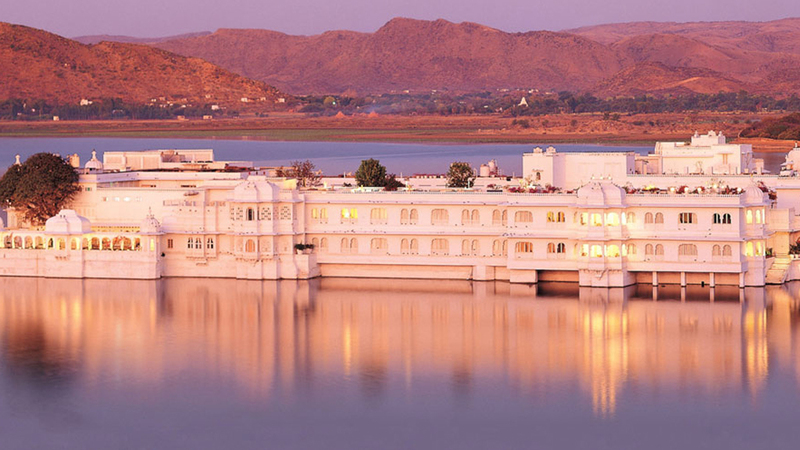 Along the east bank of Lake Pichola sits the exquisite Lake Palace on the island of Jagniwas. Constructed around the 1730s, this east-facing palatial mansion has been converted into a hotel but non-guests can still opt for a heritage walk here. Take in the gilt mouldings, latticed windows, sculpted marbles, sprawling gardens, airy terraces, and crystal fountains. 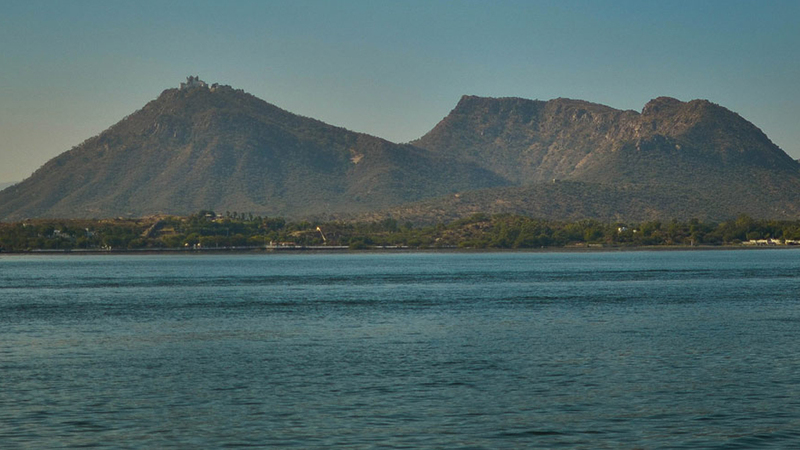 Taking a boat ride on Lake Pichola is a must as you get to see the Aravalli Hills reflect beautifully on its waters. Boat rides begin from Bansi Ghat (City Palace jetty) and last for an hour. When the water level is high, the lake is crowded with water hyacinths, and it is said that there are a couple of crocodiles that inhabit the inaccessible parts of the lake’s bank. Swimming is obviously out of the question! No trip to Udaipur is complete without a visit to the palace on the lake. 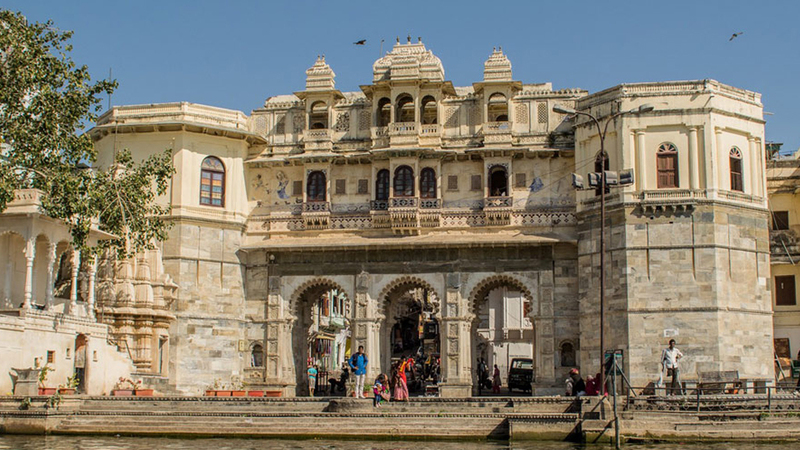 Udaipur’s City Palace has a never-ending façade that stretches for nearly 250m. This palatial complex consists of 4 main palaces and 11 smaller royal mansions. The upper terraces of the palace offer sprawling views of the lake and the old city. Travellers enter from the northern Baripol (Great Gate) and Tripolia (Three-arched) Gate. City Palace is a living museum with a vast collection of royal artefacts. Your first stop is the Rajya Angan (Royal Courtyard), decked out with paintings, exotic tiles and mirrors. Krishna Vilas has an impressive collection of miniatures worth checking out, though photography is not permitted here. The ornamental sun in Surya Chopar definitely warrants a visit; so does the Chini Mahal with its collection of rare, decorative tiles. Stop by the Zenana Mahal for its collection of paintings and the Laxmi Chowk for its tiger-trapping cage. If you’d like to further explore the history of Udaipur, the Government Museum within the City Palace contains inscriptions surviving from the 2nd to the 17th centuries. The 5th century sculptures here are interesting artefacts, as are the ornate Mewar miniature paintings. 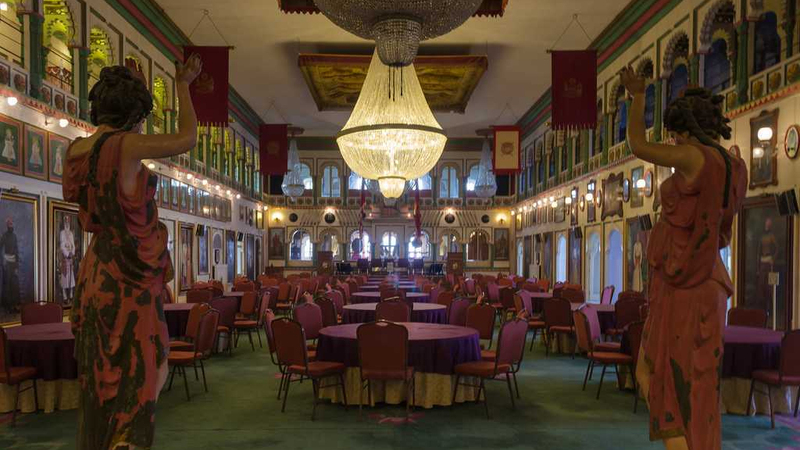 Thinks take a fantastical turn here with a stuffed monkey holding a lamp, and regal portraits of the maharajas depicting the evolution of the Rajasthani moustache. A hop, skip, and a jump away from the City Palace is the Jagdish Temple. This Indo-Aryan temple was built in 1651 and its wall carvings make it a must-visit destination. There are elephants on either side of the temple entrance, making it a truly remarkable place of worship. The temple is open throughout the day and entry is free. The City Palace sets the tone for all the other places to visit in Udaipur. Don’t leave the City Palace complex without visiting the Crystal Gallery. Formerly the royal hall that hosted the maharaja’s banquets, the Crystal Gallery’s fragile objects were imported from England in 1877. Besides the snowy chandeliers here, one will be amazed by the crystal sofas, beds, and tables. The most extravagant object in the Crystal Gallery is the opulent jewel-studded carpet. Of all the islands on Lake Pichola, Jagmandir is the one that stands out. The Lake Garden Palace was completed in mid 1600s, but still retains all of its exquisiteness. Look at the marble elephants at the entrance, the elegant Gol Mahal tower carved out of bluestone, the palace of 12 stones, and the pretty-as-a-picture Zenana Mahal! The temple here offers travellers some much needed solitude. As you stare out at the tranquil waters of Lake Pichola, past the gardens of bougainvillea and jasmine, you’ll know why travellers fall in love with Udaipur. The Monsoon Palace (formerly Sajjan Garh) was the getaway mansion for the royals when the short-lived rainy season came around. It was also used as a hunting lodge and Maharana Sajjan Singh intended to convert the place into an astronomy tower. 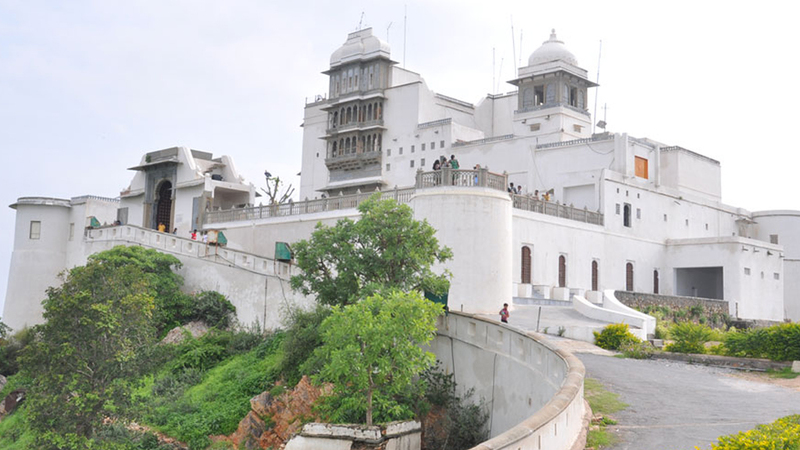 Situated around 10kms from the old city of Udaipur, the Monsoon Palace sits atop Bansdara Hills. Its position gives visitors unparalleled views of Udaipur and if you’re a photographer, you should land up here. It is one of the better sunset points around Udaipur. The Sajjan Garh Wildlife Sanctuary is not too far from here. Of all the panoramic places to visit in Udaipur, Monsoon Palace is up there with the best. 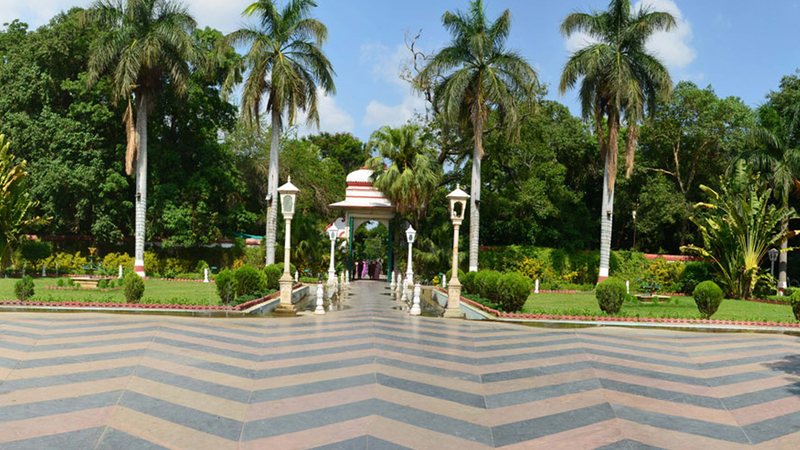 Constructed by Maharana Bhopal Singh for the handmaidens of the Princess of Udaipur, this sprawling garden is situated in the northern part of Udaipur. The tiny museum here is nothing to write home about, but the outdoor section is brilliant if you’re looking to unwind. A gorgeous lotus pool is the star attraction of this garden and so are the well-maintained fountains, marble elephants and tiny kiosks. Fateh Sagar Lake might be artificially-made in 1678 but there’s no denying its natural aesthetic appeal. Surrounded by hills and forests, a boat ride here is more than just a romantic gesture. Fateh Sagar is close to Saheliyon ki Bari and is home to three tiny islands. The one that attracts the most travellers is the Nehru Park. Boating on Fateh Sagar is best carried out in the evening for the light to work its magic on the dark waters of the lake. Another star attraction is the island that houses the Udaipur Solar Observatory. Said to be the best observatory in India, the star-gazing lookout is modelled along the lines of the observatory on Big Bear Lake, California. Rajasthan enjoys the most number of cloudless days making this location an ideal spot for an observatory. Rajasthan is well known for its havelis, and one of the oldest and best maintained is near Lake Pichola. Bagore ki Haveli offers a breathtaking view of the lake and its interiors hark back to a forgotten time. The 100 rooms have intricately decorated walls and exquisite mirror work. The rooms contain everyday antiques such as jewellery boxes, nut crackers, copper vessels, dice games, rose water sprinklers, and hand fans, among other knick-knacks. Bagore ki Haveli also hosts a light and sound show in the evenings that make the aristocratic mansions come alive. 3kms from Fateh Sagar Lake is the crafts village of Shilpgram. 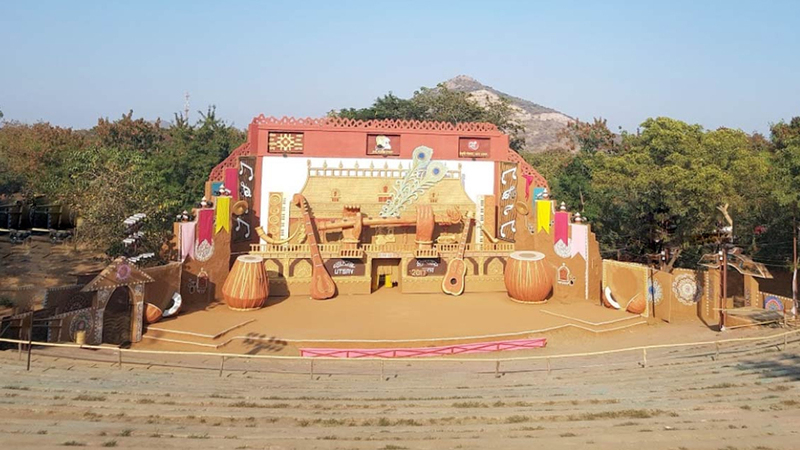 This government-run enterprise houses life-sized replicas of Rajasthani tribal huts for travellers to get their first glimpse of life in the desert. Traditional dancers and singers are always around to put on a show of their age-old songs and dances. If you’re visiting Udaipur in December, land up for the annual festival that takes place in Shilpgram. It is the perfect opportunity to mingle with local artisans and buy their crafts. There are memorial grounds all across Rajasthan but Udaipur’s royal memorial is a sprawling cluster of angel-white domes. 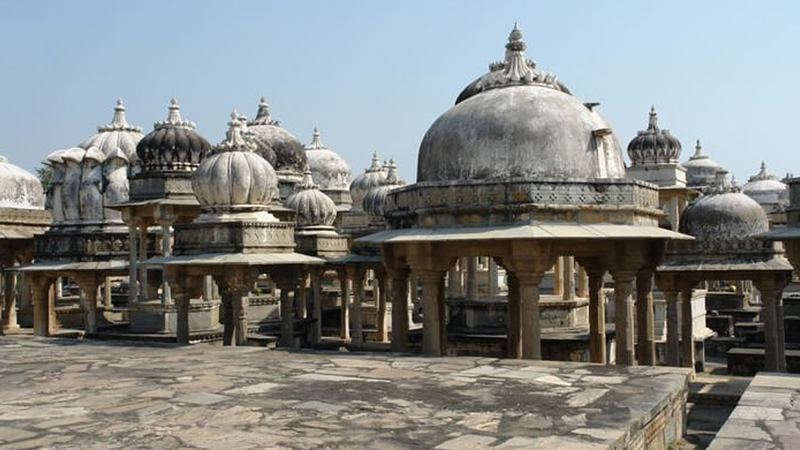 Constructed over a period of 350 years, Ahar contains more than 250 cenotaphs. Maharaja Amar Singh’s cenotaph really stands out, and there are nearly 20 Udaipur maharajas who are immortalized in stone at Ahar. The beauty of this place lies in its sombre decrepitude. If you’re a history buff, head to the nearby museum to check out archaeological finds that date back to 1700 B.C. One standout artefact is an arresting 10th century metal figurine of Buddha. If your legs are weary after a hectic day in Udaipur, head out to the Doodh Talai Lake. This water body is housed between tiny hillocks that add to its natural aesthetic. There are two gardens here that will allow you to relax and simply soak in the vibrant atmosphere of Udaipur. 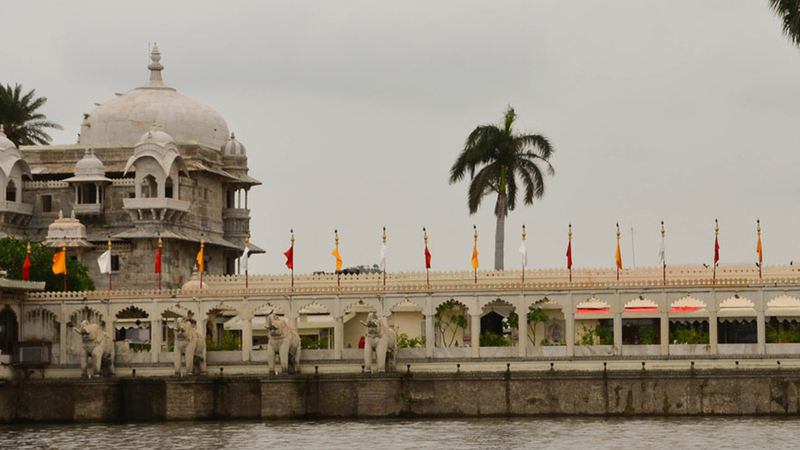 The Manikya Lal Verma Garden offers panoramic views of both Pichola and Doodh Talai Lake. Rajasthan’s first musical fountain is at the Deen Dayal Upadhyay Park. This park is also the best sunset viewpoint in all of Udaipur. Don’t forget to walk the ropeway that leads to Karni Mata Temple presided over by a white stone idol of the goddess. The ropeway offers a brilliant vantage point of the surrounding hillocks and lakes. 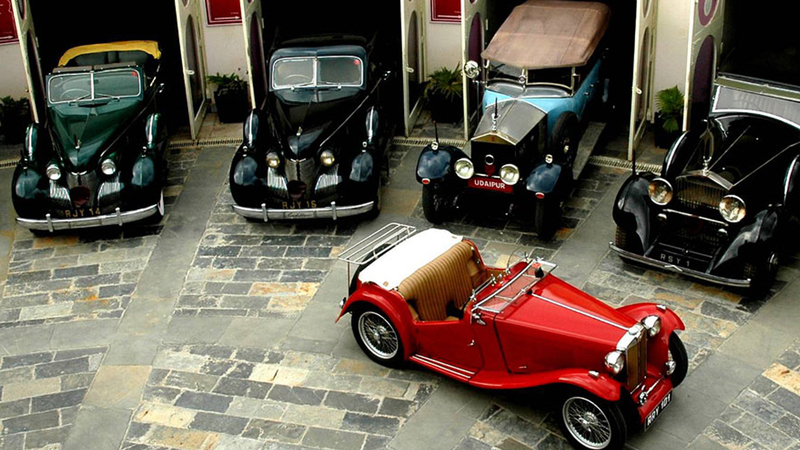 A short walk from the City Palace is the Vintage Car Museum that houses 22 vehicles straight out of motor utopia. The collection includes a 1934 Rolls Royce Phantom, a 1938 seven-seater Cadillac, an MG-TC Convertible, and a Vauxhall-12, among others. These award-winning cars are all in working condition ad offer a peek into the maharaja’s opulent lifestyle. Whether you’re a car enthusiast or not, these vehicles hark back to a time when a car was more than just a status symbol. The city’s all-round romantic allure is down to a handful of places to visit in Udaipur that are a delight to the senses.